Spiritual growth is enhanced by involvement in and exposure to art. The Gallery at First Parish is intended to be a service to the parish, the artist and the wider community by deepening spiritual exploration with exhibits of the work of visual artists who seek to contribute to a deeper understanding of the human condition. These exhibitions may reflect congregational values in focusing on social justice issues or topics that generate discussions and open minds. Shows in the gallery range from acrylic, oil and watercolor paintings, photography, printmaking, collage, wood sculptures and mail in art projects among other mediums. 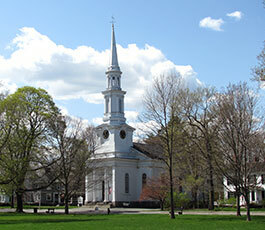 Artists are members of the congregation, the greater Lexington community and sometimes from all over New England. The gallery has shown works by artists such as Nancy Burdine, Parker Hirtle, Sirarpi Walzer, Emma Scott, Zoe Perry-Wood, and Lynne Yansen. The church has 250 members and the gallery has high foot traffic due to Sunday service and coffee hour as well as functions that take place weekly in the gallery space. Future goals include upgrading the lighting to gallery standard and upgrading the hanging system to be more user friendly and attractive.